Nancy (Gabrielle Union) has had her hands full trying to raise three kids alone since her divorce from J-Jizzy (Charlie Murphy), a narcissistic rap star who’s too self-absorbed to bear his fair share of the responsibility of raising the children. Since he doesn’t devote enough quality time to them, she’s ended up overburdened and neglecting her own needs. This state of affairs hasn’t been lost on the youngest, Emily (Khail Bryant), who altruistically whispers to Santa Claus that her Christmas wish is for a man to pay her mother a compliment to make her happy again. 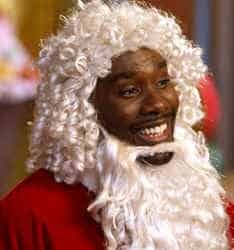 What the little girl doesn’t know is that Benjamin (Morris Chestnut), the mall Santa whose lap she’s sitting in, just happens to be a very handsome hunk underneath the fake beard and red fat suit. More importantly, he’s available and instantly smitten as soon as he looks over and gets a load of what her beautiful momma looks like. The problem is that Benjamin is just seasonal help and, after Christmas, he’ll be back at his more mundane job as an office supply salesman, although he does dream of becoming a famous songwriter. So, even after he does summon up the courage to approach Nancy in street clothes at the cleaners, he’s still suffers from low self esteem, he hightails it out of the store before she can respond. Thus unfolds the underlying premise established at the outset of The Perfect Holiday, one of those syrupy sweet romantic comedies which keeps a pair of lovebirds obviously meant for each other apart via a series of frustrating circumstances. In this case, the flies in the ointment are Benjamin’s shyness, Nancy’s cluelessness, her son, John-John’s (Malik Hammond), attempt to sabotage the relationship, and her ex’s interference, too. The movie marks the sophomore offering by Lance Rivera, and a substantial improvement over his dubious debut, The Cookout. Rivera had a most impressive ensemble of African-American actors at his disposal, but he unfortunately squandered most of their services. For instance, this is the first film in which I ever found Katt Williams boring. Ordinarily a flamboyant scene-stealer, he totally tones down his trademark trash-talking act here to play J-Jizzy’s assistant. Equally unremarkable are Oscar-nominees Queen Latifah (for Chicago) and Terrence Howard (for Hustle and Flow) who were wasted in throwaway roles as a miracle-performing fairy and latter-day Scrooge, respectively. No, the picture belongs to Gabrielle Union and Morris Chestnut, who certainly generate the genre’s requisite chemistry. This should come as no surprise, since it’s the fourth time they’ve co-starred in a romantic romp (also The Brothers, Two Can Play That Game and Breakin’ All the Rules). They handle their parts with perfect aplomb but the production’s still flawed because getting there ought to be half the fun when a flick has as predictable a plotline as this one. Again and again, the support players are shallow, one-dimensional characters, whether that be Faizon Love as Benjamin’s buddy/lovable buffoon or Jill Marie Jones and Rachel True as Nancy’s girlfriends/amen chorus. With the humor and sidebars so underwhelming, all that’s left to hold your attention is the transparent central love story which makes you wait 90 minutes for a happily-ever-after ending you saw coming practically from the opening credits. I saw mommy kissin’ Santa Claus, ghetto style. Be grateful that Gabrielle Union and Morris Chestnut have the wherewithal to elevate a mediocre script. Rated PG for mild epithets and suggestive humor.